Lots of people live without dreams. Some do dream, but a dream is a dream, that's all. We learned to be practical, but we forgot to give our dreams a pair of wings, to let them fly. Easy said than done. Everybody says that, but why so? Nothing comes easy, especially when realising your dreams, and that requires courage. Not any blunt boldness, but courage from the heart. Are you ready to give up what you have for your dreams? Do you dare to live your dreams? So congratulations to you for making your dream come true. And blessings to your son and our younger generations for a more courageous life than ours. 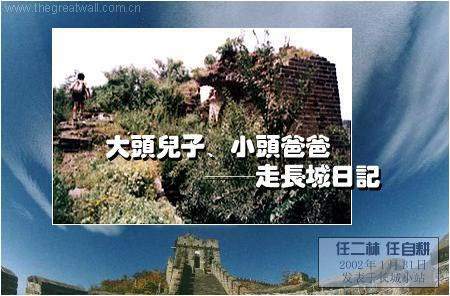 [2001.8.5] 《前干涧村～三省交界碑～将军关～平谷县城》 -- 二林　2002年3月11日发表 new! [2001.8.6] 《思乡》 -- 二林　2002年3月11日发表 new! [2001.8.7] 《平谷～密云～司马台》 -- 二林　2002年3月11日发表 new! [2001.8.8] 《司马台～金山岭～古北口～慕田峪》 -- 二林　2002年3月11日发表 new! [2001.8.9] 《慕田峪～居庸关》 -- 二林　2002年3月11日发表 new! [2001.8.10] 《居庸关》 -- 二林　2002年3月11日发表 new! [2001.8.11] 《永远的八达岭》 -- 二林　2002年3月11日发表 new!